In recent months we have been greatly impressed by the host of new and improved products presented by DW's entry-range sister company, Pacific Drums and Percussion (PDP). With more and more high-end DW features finding their way into its snares, kits and hardware, these products are no longer just entry-level but are now beginning to cater comfortably through to intermediate levels or even for the price-conscious pro drummer. 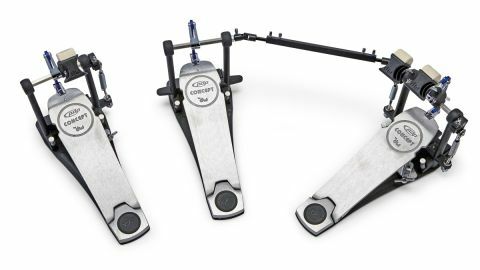 In this issue we take a look at the brand new Concept Series bass pedals, designed to be the 'flagship' of the PDP line. The Concept Series pedals are available as chain-drive and direct-drive models, although we will be focusing on the latter in this review. Both are available in single and double configurations although no sign of a left double as of yet. For those unfamiliar with direct drive as a concept, the drive mechanism uses a solid piece of metal to connect the footboard to the rocker instead of the more common chain or belt system. In the case of the Concept, a low-mass blue cobalt piece is used (which looks striking combined with the polished chrome finish of the adjoining hardware). This method offers effectively zero flex, which is designed to allow a faster and more accurate response from the pedal. Besides the drive mechanism itself, the two models appear identical. Features include XF extended brushed aluminium foot boards (270mm/10.6"), offset toe clamps, retractable spurs, DW air beaters, DW spring rocker adjustment, lightweight black aluminium baseplates and needle bearing hinges. As you may notice, several of these features have been inherited from the pro-level DW models such as the 5000 and 9000. Which, considering these have become commonly recognised as the industry standard for bass pedals, should not be under-appreciated. When compared with previous PDP models (400 and 500 series), the improvements are evident; these pedals just look and feel like professional-standard pieces of hardware. For instance, no longer is a drum key required to secure the toe-clamp to the bass drum hoop, the tension bolt has been replaced by a far more familiar side-access wing nut. The ability to quickly detach the springs is another simple but useful addition that has been implemented into the new design. Very useful for storing or transporting the pedal without putting undue tension on the springs or needing to remove the beaters. Although, for those of you that do prefer to take out your beaters, you may wish to take advantage of the new memory lock system which will not only ensure consistent beater height but also a square head-contact. The brushed aluminium finish of the footboard creates a sharp aesthetic, which goes a long way to give these pedals their own identity. A relatively subtle imprint of the PDP Concept and DW logos completes the look, finished only with a black rubber disk on the heel plate containing the 'XF' logo. At a glance the aforementioned extended footboards don't appear noticeably longer, but in practice, these are unmistakably long-boards. So long in fact, that Scott Pellegrom goes out of his way in the promotional video to show you how he can play the single version with both his right and left foot at the same time (yes really, go and take a look). On a realistic note though, for ourself with size-12 shoes and an unruly slide technique, this felt like a very comfortable pedal. Heel-toe technique was also made relatively trouble-free by the length of the boards, which felt well weighted and comfortable underfoot. The double pedal wasn't difficult to tune and we were able to achieve a beautiful balance between the two pedals in no time. Spring tension is widely adjustable and ranges all the way from a completely 'dead' response right through to Chris Adler-style blast territory. On the downside though, unfortunately it is not possible to alter the angle of the beater independently from the angle of the footboard. This only really becomes noticeable whilst tinkering with the double-pedal settings, but is a noteworthy consideration nonetheless. In the Concept's defence though, this feature is usually only found on higher-end pedals and is one of the few things that separates it from the big-boy leagues. Despite the underside of the baseplate being covered in a ridged rubber layer, grip is an issue with the slave pedal on the carpeted surface on which the kit is set up. Thankfully, with a few turns of the retractable spurs, the sharp spikes help to create a sturdy foundation and eliminate any further creeping. On a random side note, it is also worth noting that the pedal would not fit our 18" jazz kick as it uses a mounting bracket. This is due to the rim of the drum obstructing the drive mechanism which protrudes slightly from the back. We guess we'll stick to our belt drive for that kit then.